We are now giving you the ‘power’. We are giving you the power to cut your power bill, the power to be free and the power to save money. When you invest in a professional residential solar panels installation from us, no longer will you have to stroke a check to your local power company each month – you can now generate your own clean electricity straight from the power of the sun. No air pollution or noise comes from solar panels either. You will not only be helping yourself with producing your own green energy, but by taking yourself off the grid, it reduces the strain on the whole of the power grid. And with the right setup, you can produce enough electricity for your needs and the excess – well, now the power company will be stroking you check for that! Most utility companies give you the same amount of money they charge you. The utility will credit you for this power at the same rate they sell it to you for. Call us today for a residential solar panel installation contractor to give you a free quote! Solar Electric panels have no moving parts! This means they are extremely reliable. Most come with an amazing warranty and designed to last for about 40 years. Solar electric generators are silent and non-polluting and serve to protect the environment. When you use solar, you are in fact producing zero emissions. 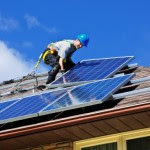 Solar can also reduce and/or eliminate bills from your utility company. You know that the rate hike is coming; it always is. Make the investment in your property – go off the grid! We have access to the highest quality photovoltaic solar panels in the industry. Not only that but our professionally trained technicians will install them quickly and accurately, while also integrating them into your power system. Our team is made of specialists from many disciplines, so their knowledge of roofing, electrical work and solar energy makes for the perfect skill set to get the job done right the first time. That is why we are the number one choice for residential solar services.